This week’s Top 10 Show features on the Top 10 Steve Carell Movies. The guys made this choice in honor of Welcome to Marwen, although it sounded as if they were more interested in Vice, which is released at Christmas. I do like Steve Carell but I am not a huge fan. There are a couple of his huge films that I am either not a fan of or have never seen. I do not like Anchorman and I have never seen The 40-Year Old Virgin. Neither of those appear on this list. Because of that, there are a couple of films on here that are, at best, okay. #10. Date Night. Starring in a rom-com with Tina Fey, Steve Carell was funny in this movie. Carell and Fey elevated the typical movie material to a more watchable level. They really did have some chemistry between them. Date Night may not be a massive film, but I did enjoy watching it. #9. Alexander and the Terrible, Horrible, No Good, Very Bad Day. The lengthy title notwithstanding, this family comedy was fun. When everything goes wrong at once for Alexander, it moves the bad luck over to his family as well. Steve Carell plays the father and does a good job with it. Alexander is a respectable film, if not a great one. #8. Beautiful Boy. This is one of Steve Carell’s top dramatic performance starring as the father of Timothee Chalamet who is suffering from drug addiction. Chalamet gives an amazing performance, and Carell’s work is under appreciated. He plays very well off of Chalamet and he has some great charisma with Maura Tierney. Carell’s work is heart-breaking and shows how hard it is for a parent to deal with the struggles of their children. #7. Get Smart. This is a fun, silly movie as Carell stars as Maxwell Smart, Agent 13. The reboot of the classic comedy from the 1960s brought Carell face to face with Dwayne “The Rock” Johnson. The end of Get Smart really elevated that movie for me. Anne Hathaway is solid here as well as Agent 99, Maxwell Smart’s love interest and partner. Would you believe…. #6. Despicable Me. The animated story of the villainous Gru who finds himself stuck with three children. The children put a dent in the career of the ultimate evil bad guy of Gru, who has started his plan to steal the moon. Steve Carell does a great voice job as Gru and the relationship with Gru and the girls is just tremendous. This film kicked off two sequels, plus a film for the side characters, the Minions. #5. Battle of the Sexes. The true story of tennis legend Billie Jean King taking on the male tennis pro Bobby Riggs in a male vs. female tennis charity match that became a national sensation and the most watched televised sports event of all time. Steve Carell portrayed Riggs, who risked his reputation in an attempt to reclaim his past glories. Emma Stone played Billie Jean King and both of these actors do a great job here. #4. Seeking a Friend for the End of the World. This film is an underrated and clever film that featured Steve Carell as a man whose wife leaves him and he, thanks to his neighbor, goes on a quest to find the love of his life before an enormous asteroid crashes into earth and kills everybody. The chemistry between Steve Carell and Kiera Knightley is off the charts and you are rooting for this pair to find each other the whole time. #3. Foxcatcher. Steve Carell is the wealthy John du Pont, who becomes obsessed with wrestling and creates a training site for the 1988 Olympian Mark Schultz. du Pont becomes downright psychotic and it leads to a violent end. Carell is the best part of the movie as he is absolutely chilling as the dark and frightening millionaire. #2. The Big Short. This is a remarkably entertaining movie about a very difficult subject, the housing market that lead to the economic crash in America. The Adam McKay directed movie is a hoot and hugely fun. Who would have guessed that this topic would work so well as a comedy. Carell played hedge-fund specialist Mark Baum, one of the horribly greedy men whose arrogance led to tragedy that nearly crippled the United States’s economy. The Big Short was great. #1. The Way, Way Back. This film was a surprise. A coming of age story of teen Duncan (Liam James) who winds up at a water park with a job because of how much of a jerk his mother’s boyfriend (Carell) was. Carell was mean and picked on Duncan horribly and it showed even more of the ability Carell had to become a character unlike himself. He was never going to be stuck in the same type of role. 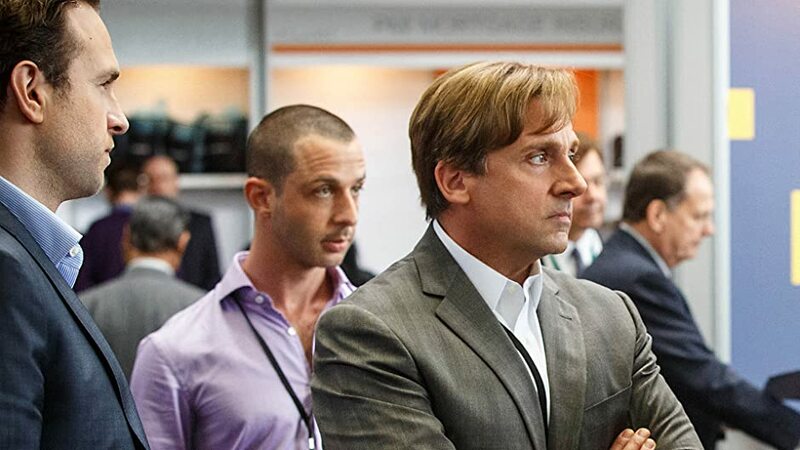 This was one of the first times we saw Steve Carell in a different role. And it was great. Honorary mention: There are some other films I enjoy. Dinner for Schmucks is one that people hate, but I found it decent. Hope Springs has Carell in a small role. Cafe Society is a film from Woody Allen that I do not remember much, but I think I liked. Yeah, I know that is not a rave review. Crazy, Stupid Love is fine too.